Following up on a previous post, this is something I cooked up while working as a “preceptor” at Duke–that is, leading seminars for students taking a course (in this case Dr. David Steinmetz’s CH13: Church History to the Reformation), in which we interacted in more depth with the primary documents. One of the first and most basic problems we have to deal with when we talk about this great North African theologian is this: [write on board] Is it AUG-us-teen or au-GUS-tin? It makes no difference to me which we say, but somewhere along the way, I was told that if you want to make it at a party with a bunch of church historians, you need to use au-GUS-tin for this man from Hippo, and reserve AUG-us-teen for the archbishop installed in England by the Pope around the year 600, who tried to bring the Celtic [or is that SSSeltic?] church into line. In any case, it doesn’t matter to me how we pronounce it today. Saying AUG-us-teen won’t lower your grade…much. 2. Start with the background from Latourette, to put Augustine in context with (1) the E/W distinctions S. has made, (2) some other “fathers,” (3) Augustine’s own personal history. 4. Throughout the process, resist going too far off into either what we think about Augustine (though that’s inevitable) or, especially, whether Wesley (Calvin, Luther, Joe Blow) would have agreed with Augustine. It is OK to do this now and again, but as in a Bible study, let’s return to the text. We need to discipline ourselves to do that because it is often so much easier to talk about our own opinions or those of our church traditions, than to confront and work through the thought of the person we are studying. 5. 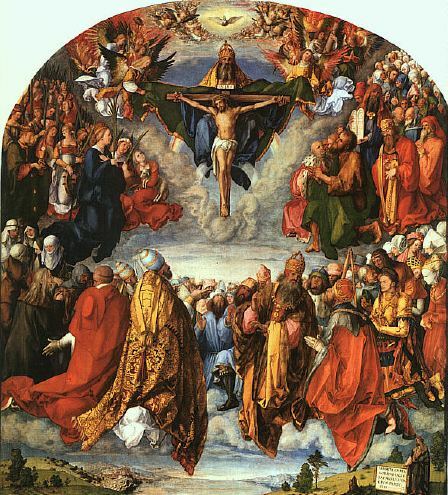 For the second half (or third, or quarter, or last five minutes) of the class, survey Augustine’s thought on (1) the status, (2) person, (3) and work of Christ, as well as (4) the Holy Spirit, (5) the Trinity, (6) the Church, (7) the Sacraments, and (8) the Last Things. 2. His experience of having been sought by God’s grace until he could not but yield to it. [“Hounds of heaven”] (remember (1) the voice in the garden, “take and read,” and before that (2) the influences of the Christian friends who would not let him rest in philosophy, but continually confronted him with his own moral failings, and thirdly (3) his mother, Monica, a Christian who prayed for him and let him know she was doing so. All of these he attributed to the grace and direct action of God. Another way to think about it—my suggested question: what drove Augustine to think about the things he did, and address them in the ways he did? My ideas—controversy of the day, heretical positions, yes. But where did controversy and heresy come from? Steinmetz has said it several times. Attempts to reconcile one part of the message of the gospel—one part of the developing canon—with another. So Augustine driven by this same need to reconcile the parts of this earth-shattering, mind-blowing message of the gospel. And he puts side by side, in a number of his theological discussions, sets of scripture that seem to contradict one another (tell story about Jack Davis at Gordon-Conwell, teaching on Calvinist vs. Arminian theology, lining up a whole lot of Scripture on each side). 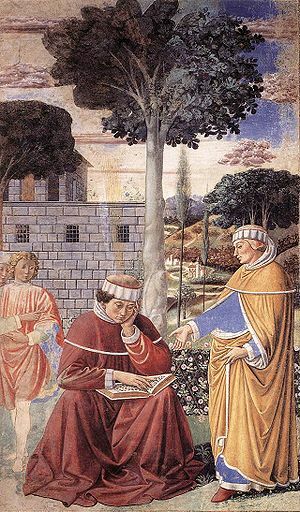 Augustine uses superior powers of logic and rhetoric in trying to resolve these disputed points—and at a few points his argumentation just seems downright twisted or ludicrous (or at least it did to me). In fact, he is willing to humble himself by saying: I don’t have the answers, I don’t know. And if you can find someone who can explain it better, then by all means go and learn from him. But beware people who think they’ve got all the answers neatly layed out. Beware the oversimplifiers, the charlatans. So first, it is appropriate for us, I think, to take three cues from Augustine. 1. To increase our tolerance level for paradox—because there are some very paradoxical elements to the orthodox theology of ANY branch of the church. 2. To practice holding our own opinions with a degree of humility, because in the end, a degree of mystery will remain. God’s thoughts are higher than our thoughts. 3. To return again and again to Scripture—to say “yes, but what about this or that Scripture passage.” As Steinmetz has been saying, a heretic is simply someone with a very good solution to a certain Biblical problem, who doesn’t pay enough attention to the canonical counter-evidence. So where possible, in the few minutes we have here, and in future precepts, let’s look at the Scriptural evidence from all sides. Ask questions to bring out the four “positions” in which freedom can be examined—pre-fall, post-fall, post-redemption, and glorification. Put them up as headings, brainstorm the nature of our situation at each stage, with reference to sin, grace, and freedom. Encourage them wherever possible to refer to the text of Augustine, and even beyond that, to texts of Scripture, especially as used by Augustine (or Pelagius). He divides our actions into three elements: power, will, and actuality or action. He says God assists us at all times by giving us the power to do good, but we must both will and act according to that power. So he can honestly say “we assert free will without denying our perpetual need of the help of God” (192)—in that, I’m guessing, we need God in order to have the “power” to do good, though we need to exercise our own free wills and our own energy in acting on that power. For a good statement on one’s condition (with regard to freedom and unfreedom) in relation to God’s grace in salvation, see the bottom of 203, paragraph F.
Now here’s one that should perk up Methodist antennae; the section marked “prevenient grace.” Is this prevenient grace as Wesley intends it, that “sets one up” to make the decision, all by one’s lonesome, to yield to God and receive salvation? Surely, Augustine must mean that. No, he says “we are also active in this: but it is in co-operation with his action, for his mercy [or grace] goes before me…for “without him we can do nothing.” (204-5) I take this to mean not only that God’s grace comes first, but that it in fact changes our will so that we are able to choose him. We do not exert our independent will in salvation, as if we always had, as fallen people, the ability to come to God, and were just encouraged by grace to go ahead and make that decision. No, according to Augustine it is always grace that carries us. Without grace every moment “bouying up” our will, so to speak, and in fact remaking it, we could not receive salvation. “it is not th[e] aid to persevereance which is now given to the saints who are predestined…; the aid bestowed on them is perseverance itself. It is not merely that without that gift they could not continue to persevere, but that because of this gift they cannot but persevere.” (206). To a good Wesleyan, that may seem like people are being made into automatons—it doesn’t seem like a proper definition of freedom, to say that a person can do “nothing but persevere,” given that “gift” from God of perseverence. But of course, there is no room for complacency here, because no person knows if they are in fact one of the elect or not—one does not know if he or she will persevere until he or she has indeed persevered to the very last moment of life. Again, this seems very deterministic to us as modern Americans. But A. says exactly what he means, and he means that this is indeed a kind of freedom, a freedom not to sin, given to us by the grace of God. One is, in the biblical language, “free from sin, because…the slave of righteousness” (206-07). This is a powerful passage, and worth reading over a few times and thinking about carefully! That seems similar to Steinmetz’s statement that God cannot not be—in a sense he is “incapable” of not being, though at the same time he is obviously free and in control of the universe. And it seems A. is saying that in a similar sense, a redeemed, glorified person is “incapable” of sinning, though at the same time free and capable of exercising his or her will. Basically man’s sin is pride, the desire of the creature to put himself in the centre rather than God, to do his will rather than God’s will. Having once put himself in the centre, his every effort to extricate himself is nullified by the fact that it arises from continuing concern for himself, and thus he is mired ever more deeply in the morass into which he has fallen. Man is still free, but only free to sin, to sink ever lower. He is not free to turn wholly to God. All of us have not only a tendency to sin, but through Adam’s sin we share his loss of status, his self-centredness, his inability to choose God, and, therefore, his guilt in the sight of God. We can be rescued only through a second birth. God’s grace, so at least some Pelagians held, is seen in giving man free will at his creation, in giving man the law as a guide to his choice, and in sending Jesus Christ who by his teaching and good example assists men to do good. From Augustine’s standpoint, this view made grace unnecessary and differed little from Stoic morality. This entry was posted in Medieval Wisdom for Modern Protestants, Resources for Radical Living and tagged Ambrose, Augustine, Augustine of Hippo, Duke University, free will, grace, seminary, sin, Teaching, Theology. Bookmark the permalink. Because any honest reading of the first chapters of Genesis shows there wasn’t one, which is why the Jews also don’t take the so-called “fall” seriously. When Adam and Eve ate the apple, the text plainly says they became like God knowing good and evil, not that they lost the knowledge of good and evil but that they gained it! Yet somehow Paulinists and Augustinians always turn it around and claim they lost what they clearly gained.